Yes. It's an exaggeration to say that Zappa was the only one. But in my opinion he is the most defining figure of progressive rock music. He was the one to conceive rock music as a medium of serious art (by serious I'm not referring just to its content, or its tone but to its intentions. To destroy seriousness is a serious intention ). And the way he did it was absolutely influential on much of the best music that came after: the Canterburys, the Cows, the Giants, the Magmas - they all have a debt there. 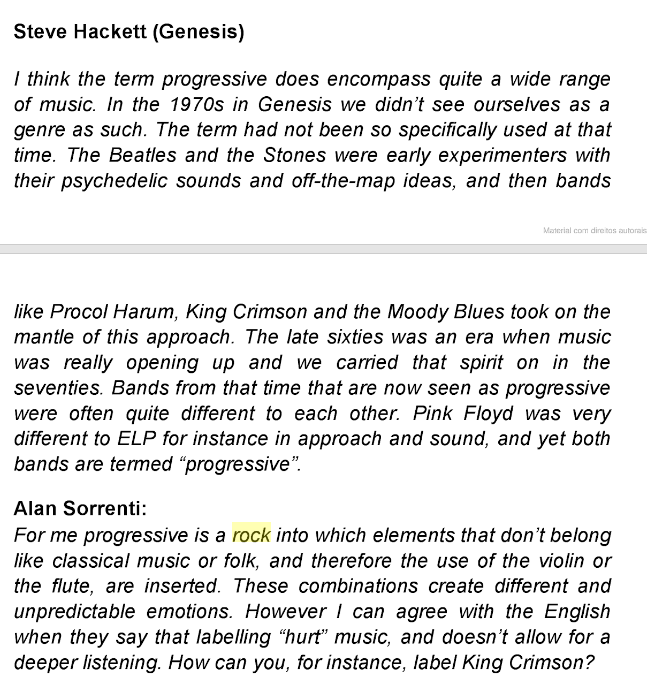 Whether one ones to call him Prog or not, there is no serious discussion for progressive rock that does not acknowledge his immense significance for the evolution of the music. Well not quite. Harry Partch devised an 43 just intonation scale and built instruments to play his compositions based on that scale. He's not by any means the only one to explore what in the west might be called "microtone" scales. Back to the topic, Thijs has every right to his opinion, Zappa is undoubtedly a seminal figure but I don't know why he would claim him as the only one unless it is out of pique or simpley being unaware of the landscape. 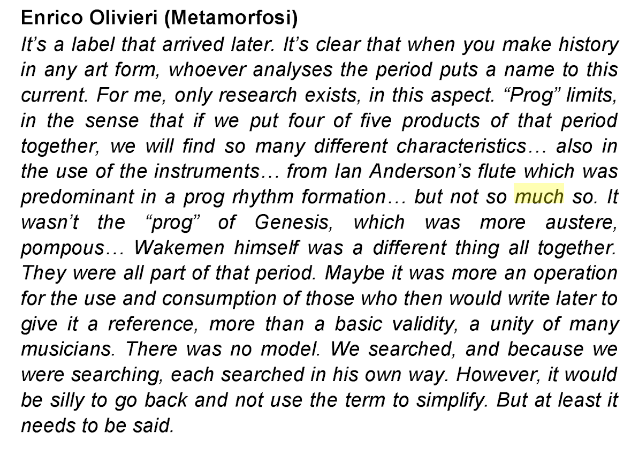 Still, what is prog is in the ear of the beholder and it is a fruitless and to me ultimately a meaningless debate. Music, like technology and culture will progress along with civilization IMO (however the later is not guaranteed). Last edited by Buddhabreath; 02-10-2019 at 04:46 PM. I agree. Saying you find something regressive rather than progressive isn't hating on it, simply putting forth a personal observation over a confusion in terms. 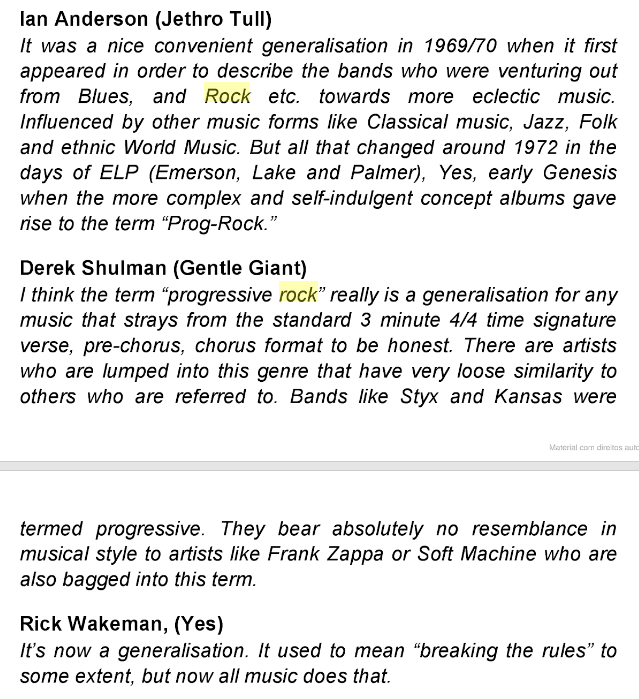 I'm fine with calling Zappa the only Progressive Rock. 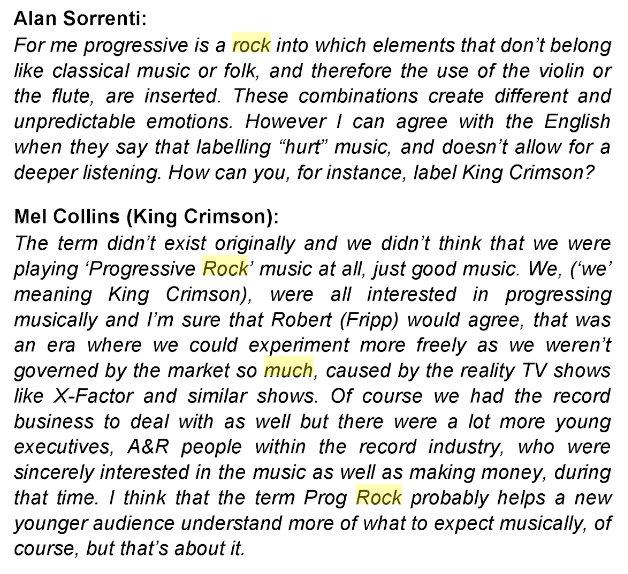 But all this other music isn't just "Classic Rock" (or a "particular type of fusion" as Steve Hackett once called it,) so we can apply a name that has no meaning to it, and forever rid the genre of the burden attached to that clunky name. I'm not fond of the unwieldy "Flonkus," it sounds like a foot disease, but a made up name would be better than Progressive Rock. I'm not fond of the unwieldy "Flonkus," it sounds like a foot disease, but a made up name would be better than Progressive Rock. If not "Flonkus", perhaps "Bromhidrosis". Folks like Zappa, who wear an occasional python boot, would prefer that word. ^ and that sounds like a lung disease. Breaking news: Musician unsatisfied by the term "progressive rock." Well, I'll put "Be In My Video" and "Suicide Chump" as way more progressive than "Ritual" any time! By the name of: STINK FOOT! The crux of the biscuit, as it were. I didn't know all the particulars, and hadn't heard the term before, but I more or less grokked what you were saying, and who it came from. I was commenting on what the word sounds like. And it does. As for "Flonkus" I was thinking more like toenail fungus than stinkfoot, but your post was still a good one. 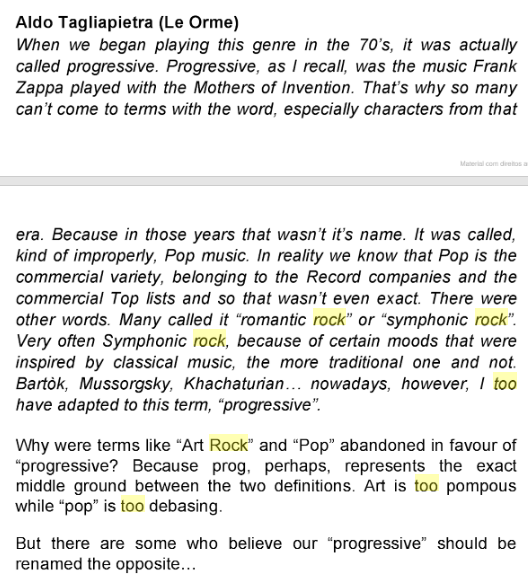 and I agree that Zappa has always been progressive and he certainly did play a healthy dose of Rock so even though his brand of progressive Rock music doesn't resonate with me except for a coupla albums, most of Zappa's music was definitely progressive Rock. Last edited by MYSTERIOUS TRAVELLER; 02-11-2019 at 12:37 AM. He's anything but a curmudgeon in person... Last week he was one of the most visible musicians on the ship, catching parts of many other bands' sets, sitting in with In Continuum and probably others, jamming with various musicians in the piano lounge, and with street musicians in Cozumel (so I heard), etc. He was delightfully engaging all week, just a lovely guy, from what I saw. 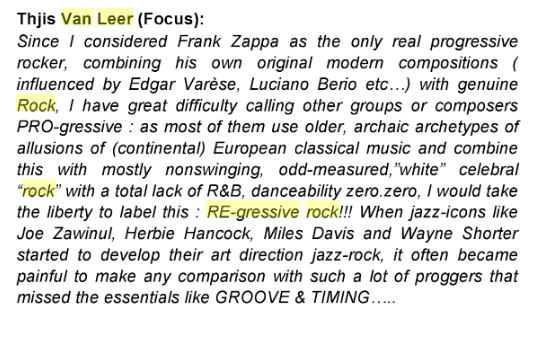 Unfortunately Thijs Van Leer is spot on. I'd be interested to read the rest of the article. I don't buy music mags because music is something I prefer to listen to or interactively discuss with the beautiful people of "Progressive Ears". "I believe music really passes between one soul and another. It's a language. It's a language of emotion. 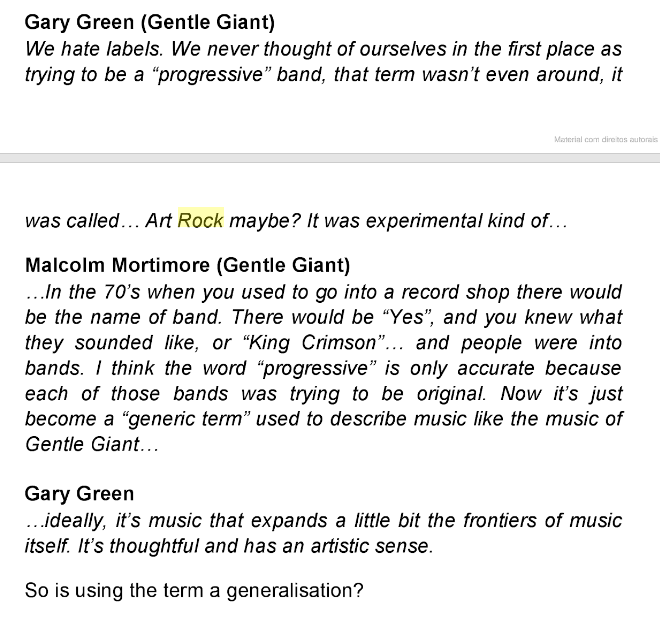 The whole idea, really, of Progressive Music was. 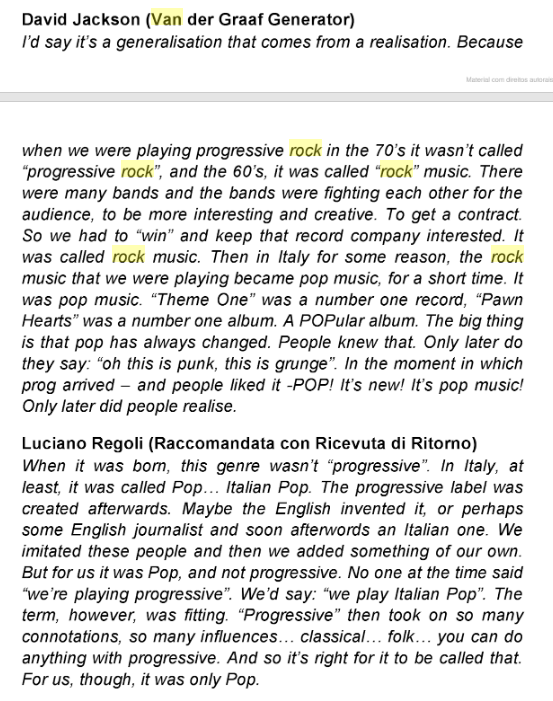 (Pause).....I don't like the term "Progressive Music" because it sounds a bit pseudointellectual. Which, really it is not; you know. All Progressive Music is; is music that uses European influences rather than American influences. You know; that's the main hallmark of Progressive Music. As far as being one of the people who pioneered it, I supposed in a way I was, but; you know. It really started before me. Probably the originators were the Beatles. And I think all of a sudden there was this urge to try and be original and to look for something original. And therefore, one would have to look in a different place. I read the article yesterday. It's a bit of a clickbait heading, but there's not much else going on in the interview other than how much he still enjoys performing. Personally I don't care if the music is actually progressive or what it is called. I don't think there's anything wrong with trying to give a name to a perceived genre (pick a name for the genre, any name) so we can at least attempt to have a conversation about music. And I don't think what the artists think on the subject is particularly relevant. If we followed that logic to its extreme we might find various artists suggesting their own terms for their music, denying similarity to any other music or attempting to artificially define their own narrow genre. I think it's better for someone (or several someones) from an outside vantage point and perspective to label it.